This multi-colored LED night light has removable, phosphorescent glow globes that give off nice calming glow in the dark, which help kids fall asleep. By sliding the switch at the bottom of base, you can set the light to a specific color or option to circulate in phases between 6 basic colors. Light Source: Fluorescent. Light Mode: 7 Color Changing. Type: Night Lights. Power Generation: Switch. Light Color: As pic. Responsible and Accessible. Power Source: DC. Body Material: Plastic. Description: Full night sky projection on ceiling and walls Soothing: Transforms nurseries and bedrooms into comfortable place that calms and soothes children Stars: Projects a starlit night sky onto the walls and ceiling of a room Calming Music and soothing sounds create magical environment There are 15 songs and 4 Different Color Changing LED Lamps within the Item Shell illuminates for a calming nightlight effect Package Included : 1x Elephant Night Light (Double A Battery NOT Included). Description: Full night sky projection on ceiling and walls Soothing: Transforms nurseries and bedrooms into comfortable place that calms and soothes children Stars: Projects a starlit night sky onto the walls and ceiling of a room Calming Music and soothing sounds create magical environment There are 15 songs and 4 Different Color Changing LED Lamps within the Item Shell illuminates for a calming nightlight effect Package Included : 1x Frog Night Light (Double A Battery NOT Included). Apply: Gift, Toy, Table Decor, Night Light and so on. Light Color: 7 Changing Color. Color: White. Due to the difference between different monitors,there are color differences,pls take the real product as the standard! Lighting effect: auto color changing, flashing beatifully. Lighting colors: multicolor. 3 x Bath Duck Toy (Battery included ). Duck color: yellow. LED button for static glow and Star button for twinkle effect. Create a magical light show with this unicorn light projector. 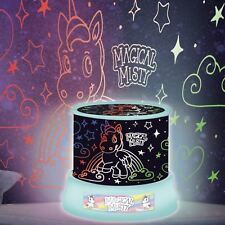 Magical Misty Unicorn LED Light Project. QUICK DISPATCH. Unicorn Projection Torch. Project 24 colour unicorn images onto walls and ceiling in a dark room. Includes 3 slide disks and 24 unicorn images. Fun projector doubles up as a handy torch. Creates clear precise images. Features: One of good gift for helping you save money. specical material, very durable for use. Special cartoon design, your children will love it. It will save power. Descriptions: It can be a great gift for your friends, kids etc. Great idea for gift, home decoration, display on shelf. Specifications: Package size:18*10*15CM Size:16*8*13CM Type: Yellow moon.sun.unicorn.cloud.cactus Package Included: 1 x Switch Night Light Notes:. (It's a great romantic night lamp and decorative light. 💡Modes: Night Light or Star Projector. 1 Night Light Star Projtor. 📌 Product Weight: 0.6 lbs. Local pick up is not available. excluded.). This super cool Spider-Man Go GlowÂ® Pal has special light up eyes for protection in the dark and suckers on his hands to scale any surface! Auto shut off after 10 minutes. Super cool Spider-Man buddy. $Tobar Kids Starlight Projector Baby Room Autism Sensory Star Moon Night Sky Light Toy Original Tobar product A beautiful Starlight Projector Perfect for any kids room. Small projector unit that projects a starry sky across the ceiling. The top of the unit is covered in specially shaped holes that sit above a light, allowing it to shine through the gaps and make stars and a crescent moon appear on the surface immediately above the projector. The device itself is purple with a starry design on the top that closely resembles the projected light patterns. Features: Moon and stars wall projector Projects starry scene directly above Purple case with starry design Requires 4 x AA batteries (Not Included) Grat gift that little ones will love.